A small unmanned boat the size of a large bath tub, which has been developed and produced by a tenant at Trafalgar Wharf is now being trialled in Japan. Just 2.3 metres long and 1.3 metres wide, the C-Stat 2 developed by Autonomous Surface Vehicles (ASV), is being used by Tohuku University in Japan to help predict earthquakes off the Japanese coast. Made out of aluminium and powered by a hybrid diesel electric system it is controlled by a ultra high frequency (UHF) data link for line of sight control or a satellite link for global control and can stay in low-speed currents for more than 20 days. For countries with shrinking navies, multiple use of the C-stat could help monitor waters while reducing costs and increasing intelligence data. 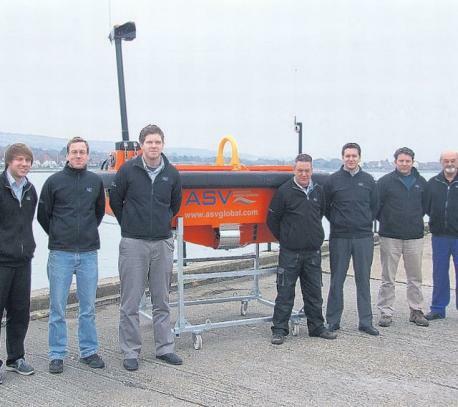 The vessel could also be used for dredging surveys and acoustic monitoring of sealife.